Dude, it’s happening. 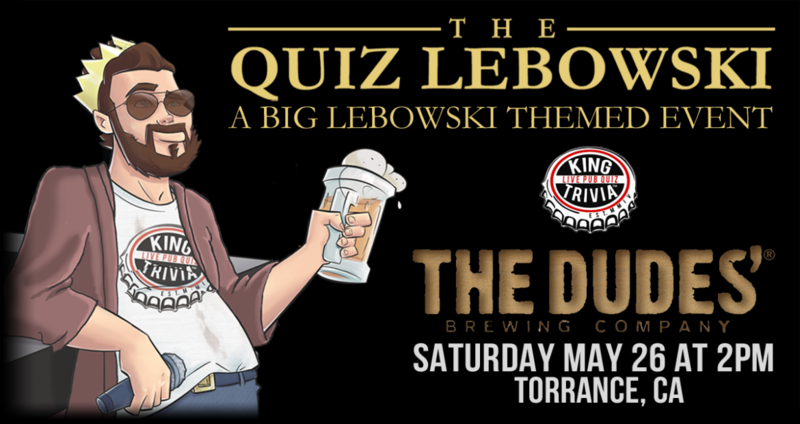 – It’s the Quiz Lebowski: The Big Lebowski theme night presented by King Trivia! Tired of always being stuck going to your landlord’s dance recital? Need some cash for a new rug that really ties the room together? The Quiz Lebowski is for you, dude. The FIRST place team will receive, like, roughly 50% of the proceeds! Dress up as your favorite character, as COSTUMES ARE GREATLY ENCOURAGED and you could win the Spirit Prize, man! You may see some of your favorite King Trivia Quizmasters playing as well, but not to worry—they paid for their ticket just like you, and the nihilists are ready to cut off the toe of anybody who gets near the question set.. So put down your copy of Logjammin’, grab your bowling friends, order up some White Russians and get ready to abide for King Trivia’s The Quiz Lebowski!